Internationally known for his famous account of the Bolshevik Revolution, Ten Days that Shook the World, John Reed’s writings about Romania are, until now, virtually unknown. As a journalist of great talent and a witness to the situation in Romania in 1915, on the eve of its entry into the war, his accounts are insightful reading for anyone interested in this period of Romanian history or in the author himself. Romania during World War I faced a unique situation. Although ruled by a German king, it had strong cultural and historical ties to France and the West. The young nation also had territorial ambitions that it hoped to satisfy. As a result, the country maintained a cautious neutrality in the early years of the war before ultimately deciding to enter the conflict on the side of the Allies in 1916. One of those who witnessed this situation was the American journalist John Reed. Internationally known for his famous account of the Bolshevik Revolution, Ten Days that Shook the World, John Reed’s writings about Romania are, until now, virtually unknown. 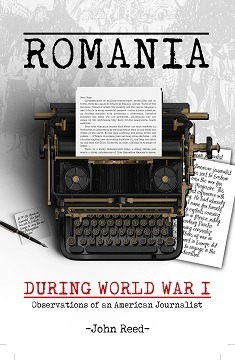 As a journalist of great talent and a witness to the situation in Romania in 1915, on the eve of its entry into the war, his accounts are insightful reading for anyone interested in this period of Romanian history or in the author himself. John Reed’s writings on Romania are comprised of two principal texts. The first, “Rumania in Difficulties,” is a chapter from his book, The War in Eastern Europe, originally published in 1916. The second, “The Rights of Small Nations,” is from a posthumous volume of stories entitled, Daughter of the Revolution and Other Stories, edited by Floyd Dell and published in 1927. In addition to these texts, John Reed published an article in an American newspaper, the New York Mail, in 1917 under the title, “Roumanian Soldier Finds His Way from Russian Front to America.” Edited, with an introduction by Dr. A.K. Brackob, this volume brings together these writings and reveals John Reed’s unique perspective on Romania. John Reed was born in Portland, Oregon on October 22, 1887. He was among the most highly acclaimed journalists of his time, famous for his first-hand accounts of the Mexican Revolution, where he rode alongside Pancho Villa, and the Russian Revolution of 1917 in his famous book Ten Days that Shook the World. Reed was also a political activist and one of the founding members of the Communist Labor Party of America. He died in Russia on October 17, 1920, and is one of only three Americans buried in the Kremlin Wall.